Dolores (Mercedes Cabral) was killed on the night of the procession, and no crime in a small town goes unnoticed. The police, church, and townspeople are off to figure out who is involved and what really happened that night. Directed by Iar Lionel Arondaing, Sa Gabing Nanahimik ang mga Kuliglig deals with an unforgivable crime, and the an examination of forgiveness, faith, and repentance. It felt like the Kuliglig is three different stories mashed into one because there is no character in focus. It jumps from one character to the next as the film goes on. 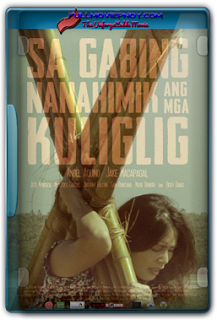 The first act focused on Magda (Angel Aquino) and her journey to repentance, but they did not dive deeper into that, instead they shifted the focus to Father (Jake Macapagal), examining his guilt and responsibility as a person of the church. Again, they left it and went on to the next character which is Lester (Jess Mendoza). The themes of forgiveness and repentance stitch these characters and their conflicts together, but because of this structure, this leaves the film fragmented.